The 75gm Moso Bag is the easiest way to maintain a fresh, dry and odor free refrigerator , freezer. 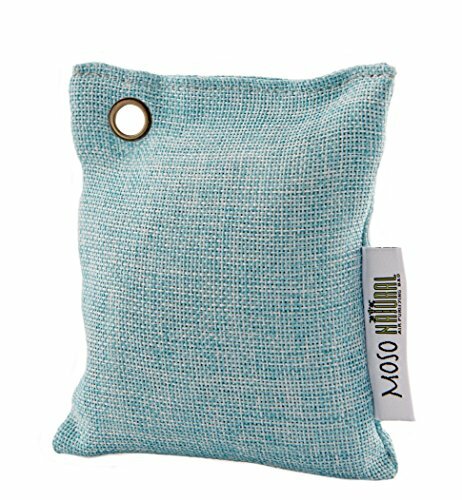 Made of just one incredibly powerful natural ingredient – moso bamboo charcoal, the Moso Bag is continuously working to remove odors, allergens and harmful pollutants. For damp, musty environments the Moso Bag will absorb excess moisture to prevent mold, mildew and bacteria from forming. The Moso Bag is chemical free, fragrance free and non-toxic to keep you and your pets safe. The bamboo charcoal is sealed inside a beautifully stitched linen bag which can be placed on any surface. With simple maintenance the bags are reusable for up two years, just place them outside in the sun once a month for at least one hour to rejuvenate. At the end of their lifespan you can recycle the bamboo charcoal into the soil. The fragrance free, chemical free and non-toxic Moso Natural Air Purifying Bag will keep your refrigerator fresh, dry and odor free. Longer lasting and more powerful than baking soda, the Moso Bag will last up to two years. Without the need for power cords or batteries the Moso Bag will work 24 hours a day, 7 days a week, to continuously keep your air fresh, dry and odor free. With a lifespan of two years, it’s an incredible value. The Moso Bag for your refrigerator removes odors of all kind, including the aftereffects of a power outage, spoiled produce, leftovers or foods with distinctive smells such as fish or cheese. We start with the highest quality bamboo in the world- moso bamboo. Moso bamboo is a species native to China that will grow to 55 feet or more in just 5 years. The process starts by the bamboo being cut down and laid out to dry for a few weeks. It is then placed into a kiln to be cooked without oxygen at 750°C. During the carbonization process, the charcoal develops millions of tiny, porous holes which is what traps the impurities in the air.